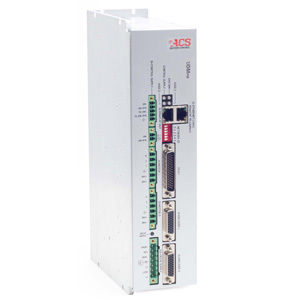 An economical line of EtherCAT network controller and multi axis machine and motion controllers with two built-in universal drives. Controls and gernerate motion profile for up to 32 axes, at scanning rate of up to 2 kHz. All drives are highly sinchronized and excute the control algorithms at a 20 kHz rate. Offered in 2 current levels- 5A / 10A and 7.5A / 15A (cont. / Peak). Powered by single phase 85 -265 V, and seperate 24VDC control supply. Supports a wide range of incremantal and absolute position feedback devices. Incremental digital, analog (Sin-Cos) encoders, absolute encoders andresolvers.